Good Morning Guys and Gals! I had the privilege of doing an interview with Jason Schubert of EquineTherapyBlogspot.com. We had a wonderful chat over coffee about all things Faith Based Equine Assisted Philosophy! It was great! I’m so thankful to Greg Kersten, the father of our work and all authentic Equine Assisted Learning work, for recommending Jason call me! This is such a great network of Facilitators we have! Among other things (lots of other things), we talked about our new Stable Guide Seminars, Healing and Deliverance, and Striding Through Grief (which we will be partnering with Tracey Boone, author of, I Can Finish Well. It’s exciting to see and experience the huge changes that are happening across FBEAP! Our ‘Unseen Facilitator’ is really showing up and showing off in arenas across the world. As he leads us to recognize lies we have believed to be true, He replaces them with The Truth that sets us FREE! UNBRIDLED!!! As we learn to be softer in His hands, give more easily to His cues, there is not trail we can’t travel safely and with great joy! If you get the chance go to: EquineTherapyBlogspot.com There are so many new things happening in the Faith Based Equine Assisted work world! This truly is “The Great Adventure”! https://www.unbridledfaith.org/wp-content/uploads/2016/02/UNBRIDLED_logo_2016.02.22-300x77.png 0 0 Elaine Davis https://www.unbridledfaith.org/wp-content/uploads/2016/02/UNBRIDLED_logo_2016.02.22-300x77.png Elaine Davis2016-11-17 10:26:032016-11-17 10:26:37Equine Therapy Blogspot Interview! Look at where we have been… God is so good! We have been to Pennsylvania, Georgia, Florida, Texas, Colorado, Illinois, Minnesota, Michigan, Louisiana, Oklahoma, Kansas, Missouri, and Wisconsin! We are headed to Hawaii next month… Only a good, good Father could do this! God is amazing! Little did I know that one day I would travel to barns around this country and the world and share the love, mercy, grace, and healing power of Jesus Christ, using the tool of Faith Based Equine Assisted Philosophy! There is nothing better than seeing people learn to “Set the Captives Free’ by partnering with Holy Spirit (our Unseen Facilitator)! We have seen countless breakthroughs and healings in the arena over the years! The goodness of God is truly indescribable! It is my hearts desire that everyone who wants to partner with horses to do the work that God has put in their hearts, be able to have this tool in their hearts and minds. I will go where ever He calls me! I hope to meet you in person soon! https://www.unbridledfaith.org/wp-content/uploads/2016/04/303533_2498503861507_1220193986_33079739_2114145925_n.jpg 209 396 Elaine Davis https://www.unbridledfaith.org/wp-content/uploads/2016/02/UNBRIDLED_logo_2016.02.22-300x77.png Elaine Davis2016-11-15 18:28:112016-11-15 18:28:11Look at where we have been... God is so good! We’re going to the U.K. in May! We’re going to Unbridled Grace May 3-5, 2017! Gill Jordan is hosting a Faith Based Equine Assisted Philosophy Seminar Certification in Ash Vale, Haunt England! If you are a native London-ite we want to see you there! This is a date with your destiny (ours, too!). More information to come soon! https://www.unbridledfaith.org/wp-content/uploads/2016/02/UNBRIDLED_logo_2016.02.22-300x77.png 0 0 Elaine Davis https://www.unbridledfaith.org/wp-content/uploads/2016/02/UNBRIDLED_logo_2016.02.22-300x77.png Elaine Davis2016-11-15 16:53:232016-11-15 16:54:14We're going to the U.K. in May! The New Healing and Deliverance Seminar was amazing! We just completed the first FBEAP Seminar Certification at Rancho Del Lago, in McDade, TX! We had a 10+ group of facilitators in training! We stepped into healing and deliverance powerfully and simply. As we allowed Holy Spirit, and the horses, we could clearly locate lies we have believed to be true and replace them with His Truth! We saw how important it is to know the difference between something that is true, and the Truth that sets us free! We worshipped under the pin oaks, worshipped at sunrise overlooking the river valley, and worked among the gorgeous, majestic Andalusians! We had two salvations and many emotional healings’. I’m not sure it can get much better! God is opening the eyes of our understanding to see Him more clearly and to know that the Kingdom has come in us! https://www.unbridledfaith.org/wp-content/uploads/2016/02/UNBRIDLED_logo_2016.02.22-300x77.png 0 0 Elaine Davis https://www.unbridledfaith.org/wp-content/uploads/2016/02/UNBRIDLED_logo_2016.02.22-300x77.png Elaine Davis2016-11-09 09:55:192016-11-09 09:55:19The New Healing and Deliverance Seminar was amazing! 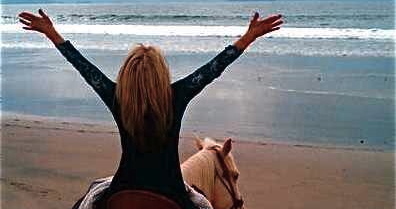 We’re heading to Hawaii next month for a private Faith Based Equine Assisted Philosophy Certification! A very focussed lady wants to be certified as soon as possible so she can begin to do the work with teens and women that God has called her to. She can’t get away to come to the mainland to get Certified so she is bringing me to her ranch to learn to use her horses to “Set the Captives Free”! https://www.unbridledfaith.org/wp-content/uploads/2016/02/UNBRIDLED_logo_2016.02.22-300x77.png 0 0 Elaine Davis https://www.unbridledfaith.org/wp-content/uploads/2016/02/UNBRIDLED_logo_2016.02.22-300x77.png Elaine Davis2016-06-07 18:57:082016-06-07 18:57:08Private Certifications Are Available! Our Relationship with Jesus is growing! https://www.unbridledfaith.org/wp-content/uploads/2016/02/UNBRIDLED_logo_2016.02.22-300x77.png 0 0 Elaine Davis https://www.unbridledfaith.org/wp-content/uploads/2016/02/UNBRIDLED_logo_2016.02.22-300x77.png Elaine Davis2016-05-09 14:13:422016-05-09 14:13:42Our Relationship with Jesus is growing! The staff at City Church want to thank you for such an awesome day away at your Farm. Your testimony was awesome, the exercises with the horses were beautiful and stretching and all very teachable. Than your staff, too, who helped out! Such dear women to be part of your ministry. You’re blessed to have them and they’re blessed to be a part. We had such a great day. We pray that your ministry (God’s given this to you!) will grow and flourish and bring healing and growth to those in Chris and those who don’t yet know God. https://www.unbridledfaith.org/wp-content/uploads/2016/02/UNBRIDLED_logo_2016.02.22-300x77.png 0 0 Elaine Davis https://www.unbridledfaith.org/wp-content/uploads/2016/02/UNBRIDLED_logo_2016.02.22-300x77.png Elaine Davis2016-05-09 13:43:172016-05-09 13:43:17So they will know! Join us at the Stamman’s Bed and Breakfast for the Impact Ministries International Women and Horses Healing Conference. We will meet at the Bed and Breakfast, meet and greet, worship, and then head to Wyndam Rose Equestrian Center for equine assisted learning exercises that will help us to locate the hidden things of the heart that have causde us pain and kept us from living the Zoe (God kind of life) life. We will locate lies we have believed and replace them with the Truth that heals and sets us free while partnering with beautiful gentle horses! The cost of Equine Assisted Exercises is $80.00 The Bed and Breakfast and meals is $70.00. If you simply would like to come to the event but not spend the evening it is $50.00 for IMI and $80.00 to Unbridled LLC for the EAL exercises at Wyndam Rose Equine Center. We will meet at Stamman’s at 9:00 a.m. Friday. We’ll head to Wyndam Rose at 10:00 a.m. and then back to Stamman’s at noon for lunch. At 1:00 p.m. we will head back to Wyndam Rose for afternoon exercises and return at 4:00 for a little R&R before dinner. We will have a message on Friday night from Pam Rosch on Hearing the Voice That Heals, followed by prayer and soaking in the Holy Spirit. Sunday will be simular. We will end at 3:00 at Wyndam Rose, then back to Stamman’s for a closing message and prayer. https://www.unbridledfaith.org/wp-content/uploads/2016/02/UNBRIDLED_logo_2016.02.22-300x77.png 0 0 Elaine Davis https://www.unbridledfaith.org/wp-content/uploads/2016/02/UNBRIDLED_logo_2016.02.22-300x77.png Elaine Davis2016-05-09 10:44:302016-05-09 12:59:17IMI Women's Conference ! Last week my wife and I went with our missionaries to a horse farm where horses are used to teach spiritual truth. Our director asked all of us to be quiet while we observed her with a horse who was unfamiliar with her. She asked us to imagine her as God, and the horse as us and encouraged us to listen to what the Holy Spirit might teach through the experience. She was in the middle of a circular pen set up in the arena and had a head set microphone on that allowed us to hear everything she was saying without her having to raise her voice. The horse was then let in with her and she began speaking softly to him, but he was having none of it. He began running around in circles ignoring her, but she kept speaking and never took her eyes off of him. Once in a while the horse would kick or change direction or even speed up to let her know he resented being locked up in this small space with her. She just kept speaking tenderly and waited for him to tire out. Finally it happened. All at once the horse stopped, went right to her, and bowed his head, letting her touch him. She told us this was an act of surrender. Now when she spoke and walked around the horse followed her wherever she went. 1. The circular pen was something artificial that she created for the purpose of establishing relationship with the horse. Our circumstances are like the pen. God allows us to feel penned in only for the reason that we might come to Him, surrender, and establish relationship. 3. No matter how fast the horse went in circles it wasn’t going anywhere. We think our strength is in activity but there can be a lot of activity with no progress. Just because we’re busy doesn’t mean we’re actually going anywhere. 4. Horses were created to be ridden in the beautiful outdoors, not stuck in a pen. God wants to “ride us” or have an intimate relationship where we become one with Him. The sooner we embrace this purpose, the sooner the adventure of where He will take us will begin. 5. It was amazing how quickly everything changed when the horse decided to surrender. It stopped on a dime, went to the middle, and decided to submit instead of fight. All the prodigal had to do was come home. All we need to do is repent and rest in Him. He’s waiting for us to get tired of doing it on our own, so we will return and He can have compassion on us. I was in my office (Legacy’s stall ) and was struggling to get the mud out of her feet. I was about ready to call it ‘good enough’ when the Holy Spirit pointed something out to me. He said, there is a stone lodged next to her frog. If you give up now she will get an abscess and be lame. You can’t quit just because it’s hard. If you don’t get what doesn’t belong lodged in her foot, out , she will experience harm. The same goes for you. You must deal with what doesn’t belong in your heart if you desire a healthy life! You can’t just swallow your pain, self medicate or ignore what’s hurting you. You must work hard to enter the rest! You must fight the fight of faith. What’s in the dark must be brought to the Light! https://www.unbridledfaith.org/wp-content/uploads/2016/02/UNBRIDLED_logo_2016.02.22-300x77.png 0 0 Elaine Davis https://www.unbridledfaith.org/wp-content/uploads/2016/02/UNBRIDLED_logo_2016.02.22-300x77.png Elaine Davis2016-04-19 11:15:522016-04-19 11:15:52Get the mud out!